Reminder- next Saturday (the 30th) is the last day we'll be in the Y until October or November. After we wrap up at 6:30, we'll be heading to Pizza Joe's- so bring some dough and get some dinner! We have been going to Father Marinaro Skatepark most Thursday nights to ride, but it isn't always a definite. It's best to contact us if you plan on heading out. Honestly, we're itching to play some polo. We do that at other locales around Butler subject to court availability. 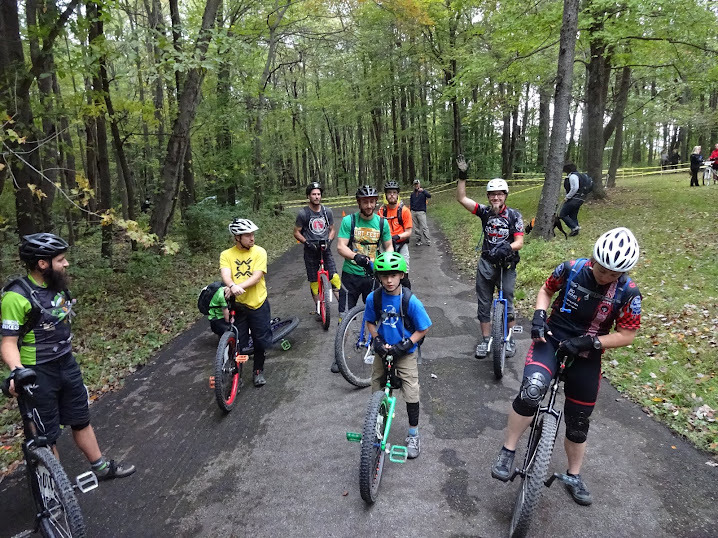 One thing we can say: Some of us will be headed to Madison, WI the last week of July for the North American Unicycle Championships and Convention. Saying it's amazing is an understatement. If you go, you will come back a better rider. If you don't, we'll refund your unicycling at the Y fees. Friday, April 15th is not only tax day, but it is also Healthy Kids Day at the Y from 3-6 pm. Several of us will be there. Join if you like. Saturday the 16th we will be packing it in just a bit early. We'll be done a bit before 6pm instead of the usual 6:30. It's a Steel City Derby Demons roller derby night and some of us are going! Even though they've got a lot more wheels than we do, it's a ton of fun to watch. If you want in, buy your tickets in advance because they'll sell out. Saturday the 30th will be the last day for riding at the Y until October or November. Keep checking back here for where we'll be riding, but you'll need to bring your own uni. We won't be providing loaners. Thursdays seem to be the gathering days for Father Marinaro Skatepark. We're there 6:30pm or so until close. Once again, bring your own uni (and protective gear! ).